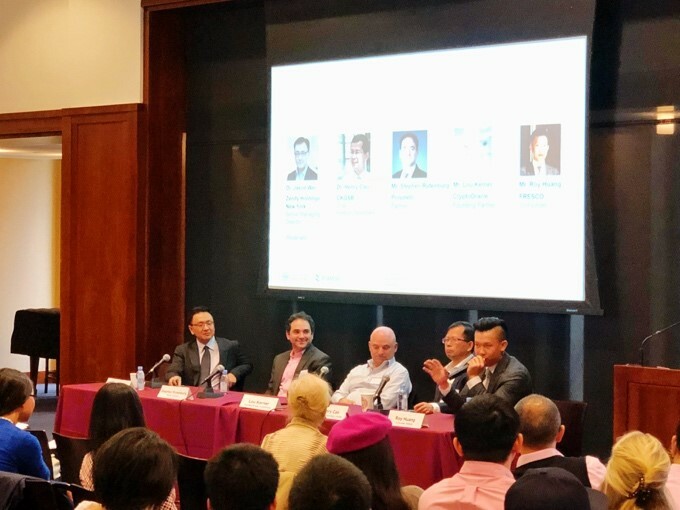 New York, NY, May 12, 2018 — as the world’s largest association of Chinese finance professionals and scholars, TCFA (The Chinese Finance Association) collaborated with Elastos Foundation to jointly host the symposium, “Elastos in a New Era of BlockChain”, on Saturday of May 12, 2018 at Fordham Gabelli School of Business in New York City. 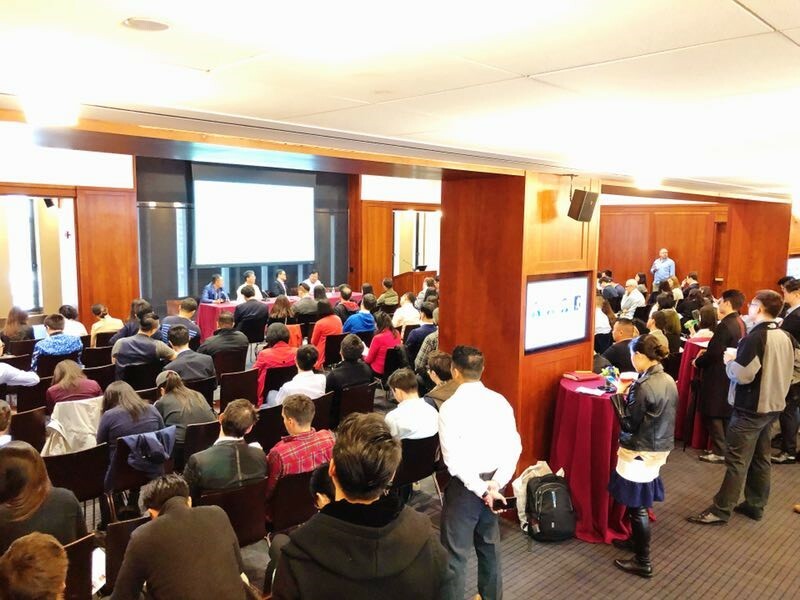 With more than 150 members and guests from the New York finance and blockchain community, the symposium presented hot topics through discussions with blockchain experts and professionals. Elastos is the world’s first Internet operating system focusing on re-decentralizing the Internet with blockchain, and starts a new era of the Internet that is secure, credible, and smart. Through this event, we brought the Elastos community and TCFA members worldwide in-depth exchanges on the State-of-the-Art of Blockchain and the unique contribution Elastos has been bringing to this space. This event was made possible through the generous support of Fordham Gabelli School of Business. To begin the event, TCFA President Dr. Li Liu welcomed guests and delivered opening remarks. TCFA President-Elect Dr. Bo Liu and TCFA FinTech/BlockChain Committee Chair Ms. Linjia Zhou introduced two keynote speakers – Dr. Rong Chen and Dr. Feng Han – co-founders and board members of Elastos Foundation. Giving very informative speeches on the future development of blockchain, Dr. Chen and Dr. Han introduced Elastos, the world’s first internet operating system focusing on re-decentralizing internet with blockchain to secure identity, and facilitating the new generation of universal apps. They concluded thirty-years development of the technology and Elastos’ breakthrough on digital assets from years of research. Following the industry overview and Elastos’ roadmap, Dr. Han officially introduced FRESCO as one of the star Dapps running on Elastos. After opening speeches, Dr. Chen, Dr. Han and Ken Huang (President of TheKey) conducted the first panel discussion, with Mr. Jerry Wang (Founder and CEO of Haitou Global) as the moderator. The second panel discussion moderated by Dr. Jason Wei (TCFA Board Director Chairman), brought more diversified panelists from the BlockChain community, including Dr. Henry Cao (Chair of CKGSB Finance Department), Mr. Stephen Rutenberg (Partner at Polsinelli law firm), Mr. Lou Kerner (Founding Partner of CrytoOracle) and Mr. Roy Huang (Co-founder of FRESCO). 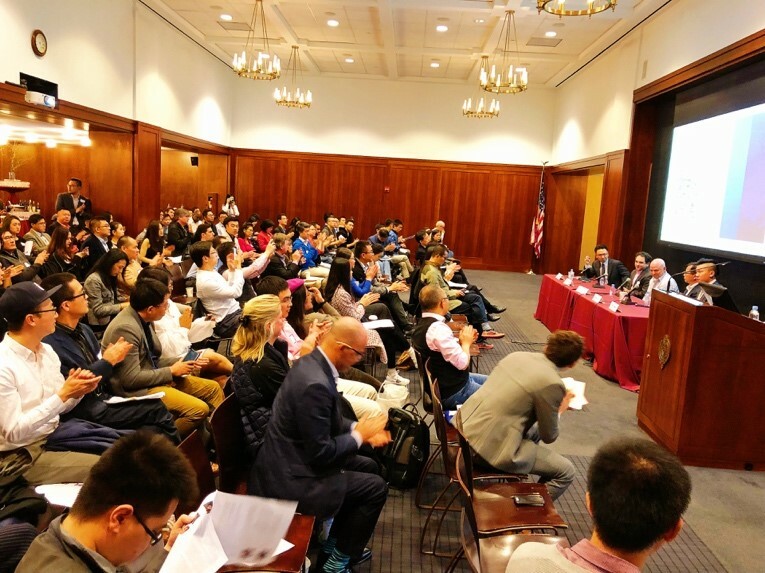 During the two panel discussions, moderators focused on government regulation on blockchain and cryptocurrency, and the future revolutions brought by blockchain technology. 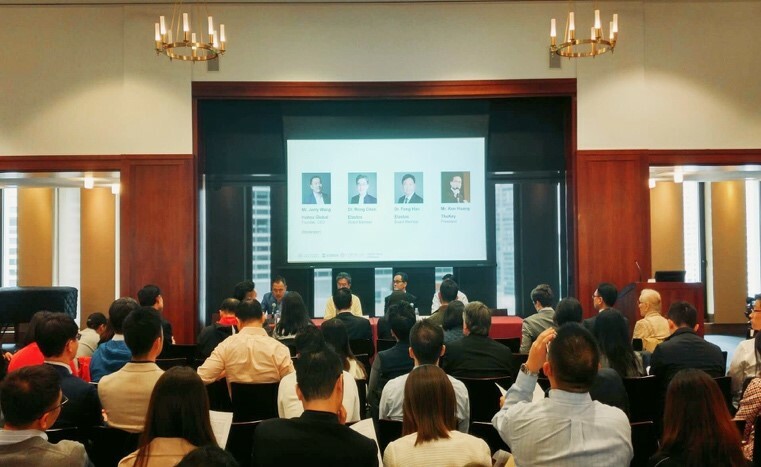 The panel started with the discussions on the current blockchain regulation in U.S. and China. Regarding blockchain’s future, Dr. Chen pointed out the trend of blockchain is similar to that of internet in the early 90s when he led the teams of Microsoft researchers. Through the development of blockchain, new business dynamics will shift to the peer-to-peer network. Ken Huang, previous Huawei VP and Chief Blockchain Scientist and Chief Identity Management System Architect, shared his opinions as an insider. Before joining Huawei in December 2015, Ken worked for CGI Federal office in the USA for 18 years and served as its Director of Cyber Security, Director of Cloud Security. Based on his working experiences with the United States and China governments, Ken believed that blockchain would be the next wave and governments need some time to digest. “The United State actually sticks to a do-not-harm policy on ICO while encouraging the whole cryptocurrency economy in the foreseeable future. Although China currently banned all the ICO activities, top Chinese officials wanted to learn this new technology, trying to find a way to regulate and protect the public’s interests”. Ken also discussed the property right of data under the context of blockchain, believing blockchain brings democracy to data by changing the giants-own-data to individual-own-data, which means companies have to pay individuals to get their data. Stephen Rutenberg, a partner at Polsinelli law firm, agreed with Ken’s opinion and focused on the need to protect investors: “Two of the primary focuses of US government regulation are, protecting unsophisticated investors, and preventing criminal activity including money laundering. The more that the blockchain community does to protect investors and to avoid criminal activity the more welcoming environment they are likely to find from United States regulators”. Stephen encouraged the industry to not tarnish this very exciting technology by allowing dubious investment schemes to be sold to unsophisticated investors. Lou Kerner, Founding Partner of CryptoOracle, a Crypto VC and Advisory firm, said that: “Blockchain is most amazing thing happens for human kinds, because it’s building on everything happened before”. He quoted from Roy Charles Amara: “We tend to overestimate the effect of a technology in the short run and underestimate the effect in the long run”. Lou encouraged people to think about the long-term effects of blockchain technology, decentralization, transparency, anonymity, and so on. Roy Huang, Co-founder of FRESCO, the first blockchain art asset network, shared his view on the blockchain industry’s extension on the art market. “Art world already tried the decentralization in multiple ways: auction houses and galleries have tried to sell derivative of artworks which are today’s prints and multiples.” Roy used Picasso’s prints as an example to explain the changes of functions in contemporary art market from the historical perspective and his first-hand experiences. He pointed out the fundamental fact that people inside the art world are waiting for a change that can expand the current market size and people outside want to join in. The combination of art and blockchain technology, which brought clear provenance, authenticity, and value appreciation, will be the next trend. Stephen Turban from McKinsey & Company acted as the anchor for this event. The event is concluded with a networking reception. We look forward to future collaboration among all the parties involved in the planning of this event. For future TCFA events or to become TCFA member, please visit us on the website at www.tcfaglobal.org. We look forward to seeing you more often.